The relics of the seven Mexican Knights of Columbus member priests martyred during the Cristero War were on display at Sacred Heart Co-Cathedral in Houston in April. You can see them at San Antonio’s San Fernando Cathedral on June 2-3, 2012. (Click the photo for more info) Portrait of the priests by artist Martha Orozco. Photo by the Knights of Columbus. Mexicans taking up arms to defend their rights during the Cristero Rebellion. Notice the flag with the image of Our Lady of Guadalupe, Mexico’s beloved patroness. The story of the Cristero soldiers and their fight for liberty is told dramatically in a new movie to be released in theaters in the U.S. on June 1st. For Greater Glory tells the largely forgotten tale of this painful time in recent Mexican history. The movie is the first major motion picture for director Pablo José Barroso, a businessman turned director of faith-based films. According to Barroso, “This is not only another Hollywood movie; it’s a movie of standing up for what you believe; it’s a… spiritual journey.” The film seeks to recreate interest in this terrible period in Mexican history, which is surprisingly little known even in Mexico (where the film debuted in April as Cristiada). Barroso hopes that through this movie he will be able to accurately depict the violence that Mexican Catholics suffered (the movie is rated R for war violence and disturbing images). This new movie tells the story of Mexico’s Cristero period through the eyes of its main character, an unlikely hero who takes up the fight for religious freedom. The impact of the Cristero War was felt not only throughout Mexico, but also in the United States, as waves of Mexican immigrants sought to escape the violence of their homeland. The exodus from Mexico’s west-central region was particularly great. Historian Julia Young writes in the Catholic Historical Review, “Of all the causes for the marked rise in emigration out of Mexico’s west-central states during the 1920s, it was the devastation wrought by the Cristero War that reinforced and solidified these trends during the latter part of the decade.” In the year 1928, for example, the Mexican government targeted this region with a campaign aimed to evacuate residents, then pillage and bomb their towns. Eyewitness Luis Gonzalez y Gonzalez describes the aftermath of such an attack against the town of San Jose de Gracia in Michoacan: “a place of roofless walls and rubble, ashes, and charcoal, with green grass sprouting in the street and on garden walls, and soot everywhere. The only sound was the howling of starving cats.” After this type of devastation, many smaller villages never recovered and remain ghost towns today. Bishop Emanuel Palomar Azpeitin of Tepic, Mexico returning to his homeland in 1929 with 27 of his fellow priests. They, along with many other priests, had been deported in 1926 by the Mexican government and lived for three years in Los Angeles, California. With access to Mexico’s new railway infrastructure, Mexican citizens left their war-torn country in droves. They not only settled in the previously traditional migrant areas of southern California, Texas and the rest of the southwest, but also began to make their way to other parts of the U.S. that had previously had few Mexican immigrants: the midwest, for example. If you have Catholic ancestors who lived in or emigrated from Mexico during the Cristero period and would like to learn more, it is difficult to find much information on the internet. However, these links may help to give you a basic understanding of this largely unknown period in Mexican history, help you learn more about its impact on your family, and get you started tracing your Mexican family tree. The Cristero Rebellion: The Mexican People Between Church and State 1926-1929 (Cambridge Latin American Studies) by Jean Meyer – This historian’s in depth research into the Cristero period spanned seven years as he traveled throughout Mexico unearthing previously unknown records at archives and Catholic churches. Mexican Martyrdom by Rev. Wildrid Parsons – Written in 1935, this book provides a vivid picture of the trials of Mexican Catholics during the 1920s. Blessed Miguel Pro: 20th Century Mexican Martyr by Ann Ball – The inspiring story of the famous Mexican priest, martyred in 1927. A very special thank-you to two high school students whose research into 1920s Mexico was a big help to me in preparing this article. Their historical exhibit received honors within this year’s National History Day competition. By secular standards, St. John Neumann’s story is a typical American immigrant success story. He arrived in the U.S. in 1836 from Bohemia, alone and without the promise of a job. But he quickly achieved his dream of becoming a priest, and sixteen years later, at the age of 41, he became the bishop of one of the largest dioceses in the United States, Philadelphia. But, despite St. John Neumann’s rise to success, he was not the typical American immigrant – he was a saint! He would have eschewed the idea that his life was successful and would have preferred a different kind of success – spiritual. He did not want to be a bishop and only wanted to serve God and serve God’s people. It is because of his pastoral works, his humility, and his acts of kindness that he is remembered today. For his feast day, celebrated today in the U.S., I would like to share more about his amazing life and also relate how his life affected the lives of my family years after his death. John Nepomucene Neumann was born on March 28, 1811 in Prachatitz, Bohemia (today, the Czech Republic). From childhood he had inclinations towards the priesthood, and his high intelligence allowed him to receive higher education. He wanted to enter the seminary, but he had heard that the overcrowded seminary only accepted applicants with letters of recommendations from important people. Undaunted, and unshaken in his faith, he applied anyway – without recommendations – and was admitted to the seminary in 1831. At the seminary, John excelled in his studies and showed a strong proclivity towards foreign languages. But he faced obstacles as well. At the time, the seminary was rife with heretical thought and an almost unholy atmosphere, and he lacked a spiritual director. The darkest hour came when the bishop indefinitely postponed all ordinations in the diocese because of an abundance of priests! But John’s faith never wavered – when he heard that America desperately needed German-speaking priests, he decided to make the long journey. John Neumann arrived in New York in 1836. When he contacted the bishop the next day, Bishop Dubois was delighted at his arrival – so much so that John Neumann was ordained a priest only three weeks later for the diocese of New York. The diocese at the time included the entire state of New York and one-third of New Jersey. Of the 200,000 Catholics in that large area, there were only 36 priests – and only 3 spoke German. John was immediately sent to the parish of Buffalo, which included over nine hundred square miles from Lake Ontario to Pennsylvania. The time John Neumann spent as a parish priest ministering to the Catholics in this large area is in itself worthy of admiration. John Neumann worked tirelessly to provide sacraments to the Catholic immigrants as well as minister to their educational and medical needs. At this time in American history, anti-Catholicism was rampant. John Neumann made sure that Catholics were educated in their faith, and he also won over many converts to the faith. Eventually, traveling by foot over vast distances put a strain on the priest’s health. John felt that his spiritual needs might be better met through a religious community, and in 1840 he joined the Congregation of the Most Holy Redeemer. Two years later, he became the first Redemptorist priest to make his vows in America. As a Redemptorist priest, John Neumann was assigned to parishes in Baltimore and Pittsburgh and continued his ministerial work with the same intensity as before. He became so well known for his piety, learning, and work ethic that in 1851 Archbishop Kenrick, Archbishop of Baltimore and former Bishop of Philadelphia, asked John Neumann to be his confessor. Much to his horror, Archbishop Kendrick asked the Pope to appoint John Neumann as his successor in Philadelphia. John Neumann felt he was not worthy of such a dignity, and if appointed it would cause “a calamity for the church.” Pope Pius IX felt otherwise, and in 1852 John Neumann was consecrated as the 4th Bishop of Philadelphia. At that time, the diocese of Philadelphia consisted of two-thirds of Pennsylvania, western New Jersey, and all of Delaware. In this vast area were 170,000 Catholics in 113 parishes ministered by only 100 priests. Although we think there is a shortage of priests today, these numbers are staggering. John Neumann exhibited the same zeal in his work as bishop as he did as a priest. He sought to visit every parish in the diocese as well as hospitals, orphanages, and religious communities. He avoided the pomp and ceremony customary of the office of bishop and preferred to live on a smaller scale without secretarial staff. He continually gave his belongings to the poor. Other bishops scoffed that Bishop Neumann would wear tattered clothes unbefitting of his “stature”. He never rebuffed the remarks nor defended himself, but merely continued to live as piously as he could. 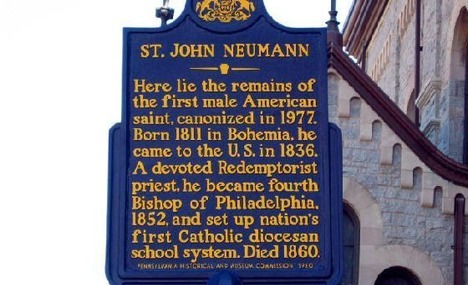 John Neumann accomplished much for the diocese of Philadelphia. First, he attempted to make a pastoral visit to every parish – even the most distant from the city of Philadelphia. He used this visits as an opportunity to meet the parishioners, and because he spoke eight languages he was able to hear confessions for many immigrants. Next, he established the first parochial school system in America. As if that weren’t enough, he published catechisms that remained in use until the publication of the Baltimore Catechism thirty-five years later. John Neumann, the Bohemian immigrant, founded the first Italian Catholic parish in the United States, St. Mary Magdalen de Pazzi in Philadelphia. He introduced the devotion of Forty Hours to the United States as well. And in a rather amazing accomplishment, in the eighty months he served as Bishop of Philadelphia, he founded eighty new churches as well as forty new schools. He even founded an order of religious sisters, The Sisters of the Third Order of St. Francis. The bishop went to run some errands. On his trip home, he collapsed on the corner of 13th and Vine Streets and died. He was only 48 years old. He was buried in the Redemptorist church of St. Peter. 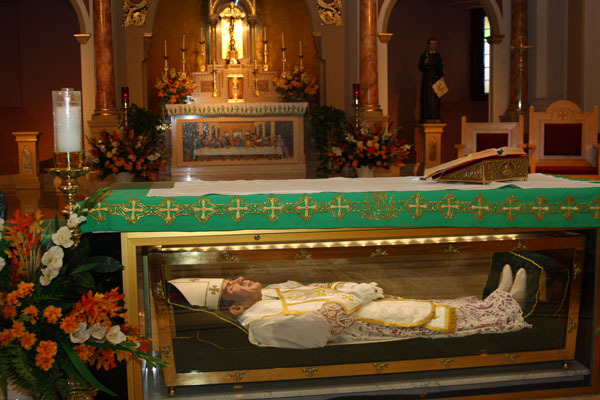 Today, St. Peter’s has a shrine to St. John Neumann and visitors can see his body lying under the main altar. Soon after John Neumann’s death, there were reports of miraculous cures from his intercession. The first scrutinized miracle took place in 1923 when an 11-year-old Italian girl was cured of peritonitis. In 1949, a 19-year-old college student in the Philadelphia area was near death after a car accident; he was healed after prayers for John Neumann’s help. These two miracles led to the beatification of Neumann in 1963. The third miracle – the one that led to Neumann’s canonization – took place in 1962 when a young Philadelphia boy was given six months to live after a cancer diagnosis. After visits to the shrine at St. Peter’s to pray, he was completely healed within five months. St. John Neumann was canonized on June 19, 1977. St. John Neumann left his mark on Philadelphia in many ways. My family immigrated to Philadelphia over forty years after his death, yet his life impacted my family in several ways as well. First, the Redemptorist church in which St. John worshipped and was buried, St. Peter’s Church, is in the neighborhood where my Bavarian great-grandparents settled. It became their church, my grandparents’ church, and my father’s church. All worshipped there in the presence of St. John Neumann’s body, and the story of his pious life and miraculous intercessions were well known in my family as a result. Also, as mentioned above St. John Neumann is known as the Father of the Parochial School System. My mother and grandfathers attended public schools, but my father, two grandmothers, my brother and I and numerous cousins all attended Catholic schools in Philadelphia. Until the Catholic school system was organized by St. John Neumann, there was no centralized method for Catholic education in this country. Those of us that “lived through it” are grateful that it existed. We always felt special attending Catholic school because we shared our faith daily in addition to sharing the quest for knowledge about other subjects. As Catholic school children, we had a greater exposure to attending Church and learning about the faith, and we got to experience priests and nuns as our teachers. The institution of the Forty Hours devotion by Neumann also impacted my family’s lives. Forty Hours is a 40-hour-period of Eucharistic adoration that represents the traditional time Jesus’ body was in the tomb from his death to Resurrection. The Forty Hours devotion began in Italy by St. Phillip Neri, but St. John Neumann was the first to introduce it to America. My teenage experiences with the annual Forty Hours at my parish positively impacted my faith. It became a celebration of sorts, and the music, prayers, and special guest preachers revitalized the parish. Coincidentally, the priests who came to preach were from the Redemptorist order and lived at St. Peter’s – they were wonderful preachers. St. John Neumann’s name has a way of occasionally appearing in my own life because of the many churches he built during his tenure. Most of these are not within the city limits of Philadelphia, but quite far away, and stumbling on to these legacy churches showed me just how much territory Neumann covered as a pastor. My first Neumann-church find was somewhere near Scranton, PA – unfortunately, I do not remember the name, and there are about 27 churches founded in what is now the diocese of Scranton in addition to the cathedral. As teenagers we were “far away” from home – nearly four hours north on the PA Turnpike – and visited a small, old church on our travels. On the wall was a sign that indicated St. John Neumann had made a pastoral visit to the church – and I wondered just how long that horse ride must have taken! I came upon another of his churches close to the town where I now live. The church, St. Peter’s in Riverside, NJ, would have been another long ride and must have included a ferry across the river since Neumann lived before the local bridge was built. This St. Peter’s is also the church where my brother got married. Whether or not you have had that “personal” connection to the saint as I do, after reading his story hopefully you will find St. John Neumann’s life worthy of admiration for all of the good works he accomplished. He also continues to do good through intercessory prayer and miracles. All of that is rather amazing for a man who was told that he couldn’t be ordained because there were too many priests! I pray that the church will be blessed with more priests like St. John Neumann. I come from a long line of Polish Catholics. I’ve long been interested in how my ancestors celebrated the various holidays, saint’s feast days, and other holy days. The Catholic Poles had many, many religious ceremonies and prayer services unheard of here in the United States or elsewhere in the world. Poland has long been a country that struggled for peace, was dominated and taken over by its neighbors, and suffered when those neighbors tried to extinguish its very culture. Through it all, the strong faith of the people of this predominantly Catholic country has prevailed. It’s enlightening to take a look at the religious rites that were and still are practiced in Poland, the land of my ancestors. Here is an example of a Polish Catholic prayer service for the Advent season. A traditional Polish observance of the season of Advent differs greatly from the heavily commercialized time before Christmas in this country. It is a time of reflection and spiritual preparation for the coming of Christ at Christmas. The word advent comes from the Latin adventus which means the coming. We await the coming of the Messiah not only in the flesh but also for His second coming as Judge at the end of the world. Hope is the dominant characteristic of the season of Advent. There is a focus during the season on our longing for God’s grace and His friendship. It is understood that parties, weddings, and other boisterous events would be an obstacle to the search for God’s grace and building that friendship, and so they are avoided. Advent is also a time for reconciliation with God through the Sacrament of Penance. Throughout advent many people in Poland participate in an early morning Mass called Roraty. It begins just before sunrise in almost complete darkness in the church. The name roraty comes from the ancient Latin chant that is sung to begin the service: Rorate Coeli, de super; et nubes pluant justum – O Heavens, drop down your dew from on high and may the Just One be rained by the clouds. The words of the ancient hymn are a plea for God’s gift of His Son. As the hymn is sung candles are gradually lit in the dark church. Roraty is a kind of daily Advent vigil ceremony. The people wait in darkness not only for the rising of the sun but ultimately for the return of the Son of God, so beautifully symbolized by dawn’s first light. The roraty service has a definite Marian dimension to it as does the entire season of Advent. In the sanctuary is found one special candle that is more predominate than the others used in the ceremony. It is traditionally decorated with greenery and white ribbon in honor of the Blessed Virgin Mary, who plays and important role in the raining down of the Just One. The Advent roraty ceremony originated in the 13th century during the reign of King Boleslaw Wstydliwy (the Bashful) who was the husband of St Kinga. According to historical documents, a representative of every social state lit one candle of a specially prepared seven-branch candelabrum in the cathedral at the early morning service, starting with the king. As each man lit his candle he proclaimed: Paratus sum ad adventum Domini/Gotow jestem na pryjscie Pana – I am ready for the coming of the Lord! After the king lit his candle he was followed by the cardinal primate, then a senator, a nobleman, a knight, a townsman and finally the seventh candle was lit by a peasant farmer. Preparation for the Lord’s coming, both interior and spiritual as well as exterior and temporal is an integral part of a truly Catholic observance of the holy season of Advent. Many thanks to Rev. Mark A. Borkowski, Associate Pastor, Ss Peter & Paul Catholic Church, Detroit, Michigan, who was kind enough to allow me to share his article with you. Below is a video showing a portion of a Roraty service filmed in a village not far from my maternal grandfather’s village in Poland. Back in October 2007, I traveled to Lithuania to spend a week with my relatives. My cousins Liliana, Aidas, and Vitas showed me a side of Lithuania I never would have seen on my own. One day, while walking through the capital city of Vilnius, Liliana brought me to Vilnius University, the oldest university in the Baltic States and Liliana’s alma mater. Within the walls of the university stood St. John’s Church (Šv. Jonų Bažnyčia). SOURCE: St. John’s Church in Vilnius (Vilnius, Lithuania); photographed by Stephen J. Danko on 21 October 2007. 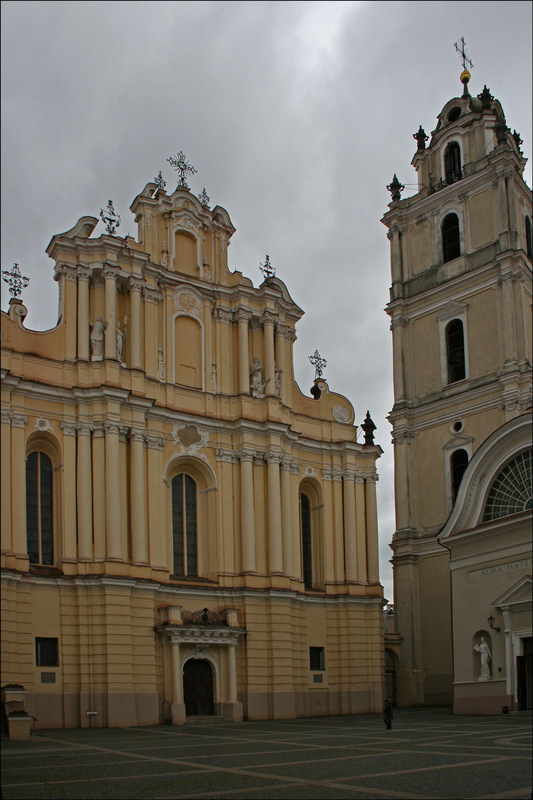 Saint John’s Church in Vilnius is the place where Saint Rafał Kalinowski was baptized. Born on 01 September 1835, he was baptized on 09 September 1835 with the name Józef, the second child of the Polish nobles Andrzej (Jędrzej) Kalinowski and Józefa Połońska (m. 1832). Józef’s brother Wiktor (b. 1833) had been born in Vilnius two years earlier. SOURCE: Šv. Jonų Bažnyčia (Vilnius, Wilno Gubernia, Russian Empire), “Vilniaus Šv. 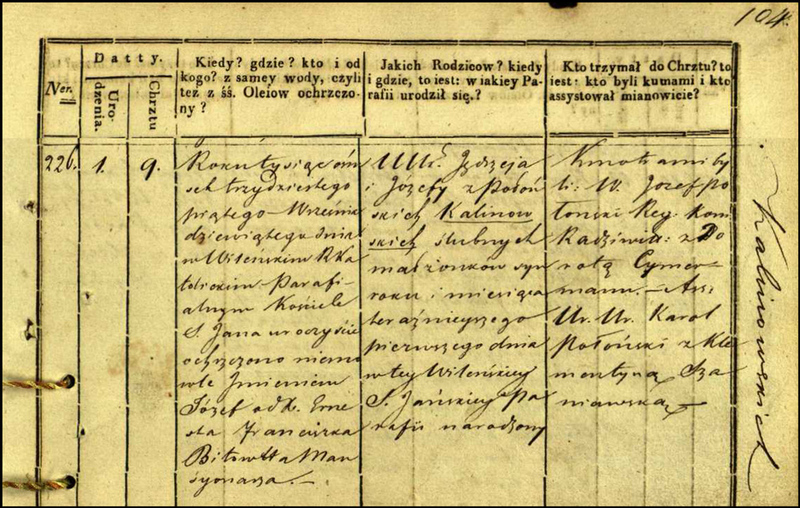 Jonų RKB gimimo metrikų knyga [Church Registry Books of St. John’s Church, Vilnius],” page 104, entry 226, Józef Kalinowski, 09 September 1835; digital images, ePaveldas (http://www.epaveldas.lt/vbspi/biRecord.do?biExemplarId=30557&psl=209 : accessed 19 November 2011). Young Józef’s mother died within a few days of his birth. Józef’s father married Wiktoria Połońska (m. 1838), the sister of his deceased wife Józefa. Wiktoria gave birth to three children: Emilia (b. 1840), Karol (b. 1841), and Gabriel (b. 1845). When Józef was nine years old, his stepmother Wiktoria died. Józef’s father married again, this time to Zofia Puttkamer (m. 1848). (Zofia was the daughter of Maria Wereszczak, the first great love of famed Polish/Lithuanian poet Adam Mickiewicz). Andrzej and Zofia had four children: Maria (b. 1848), Aleksander (b. 1851), Monika (b. 1851), and Jerzy (b. 1859). At the time Józef was born, Vilnius was part of the Wilno Gubernia of the Russian Empire. He attended university in St. Petersburg and, after graduation, Józef was appointed a lieutenant in the corps of engineers in Russia. His resigned his commission with the Russian military in 1863 and joined the insurgents against the Russian government in the January Uprising. After the failed uprising, Józef was condemned to death, a sentence that was commuted to ten years of hard labor in Siberia. After his release from Siberia, Józef joined the Carmelite Order in Graz, Austria where he took the religious name Rafał (Raphael). Brother Rafał traveled to Györ, Hungary to complete his studies and was ordained to the priesthood in Czerna, Poland where he was appointed prior. Finally, Rafał was appointed prior and vicar provincial for the Discalced Carmelite nuns in Wadowice, Poland. SOURCE: Saint Rafał Kalinowski (http://tinyurl.com/7bboj5j : accessed 19 November 2011) citing Praskiewicz, Szczepan T. 1998. Saint Raphael Kalinowski: an introduction to his life and spirituality. Washington, D.C.: ICS Publications. Prayer was the source and guiding principle of Rafał’s life and he worked to instill this philosophy in the Carmelite Order. Others were drawn to Rafał because of the authenticity of his prayer. Rafał died in Wadowice on 15 November 1907 and was buried in the convent cemetery. However, large numbers of pilgrims came to visit his grave, carrying away handfuls of soil. His remains were moved to a tomb but even that solution did not deter the pilgrims who scratched at the tomb, leaving with bits of plaster. Finally, his remains were moved to a chapel in Czerna, Poland where they are today. Rafał Kalinowski was beatified on 23 June 1983 and canonized on 17 November 1991 by Pope John Paul II. That Pope John Paul II would beatify and canonize Rafał Kalinowski is quite fitting. Eighteen years after Rafał Kalinowski died in Wadowice, Karol Wojtyła, the future Pope John Paul II, was born in the same village. Saint Rafał Kalinowski’s feast is celbrated on November 19. The only experience I had as a child with military chaplains was watching Fr. Mulcahy on the television show M*A*S*H. As a teenager, I learned that my own pastor, Msgr. 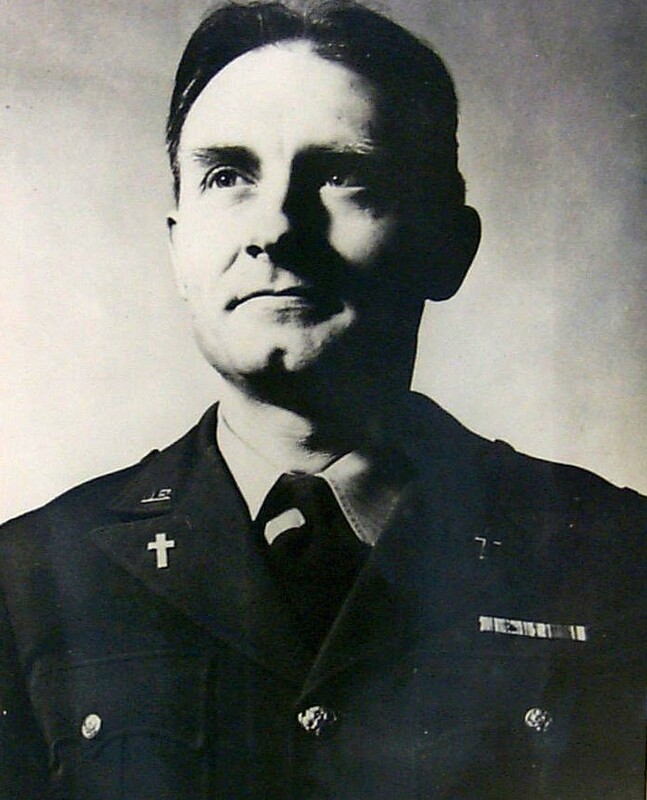 George Wierzalis, had been a chaplain in the Pacific theater during World War II. Although I knew “Father George” well during my teen years working at the rectory, he never talked about his experience as a chaplain. According to his assistant pastor, he had ministered to so many young, dying men that he didn’t want to discuss it. Fr. George died while I was in college, so I was never able to ask him more about his military service. In my late 20’s, I came to know military chaplains in an entirely different way while working as a contract specialist for the Defense Logistics Agency. My area procured the uniforms and equipment needed by the military. Although our sole focus was clothing and textile items, we became responsible for a new class of items – ecclesiastical supplies. Fortunately for my office, I knew a good deal about these supplies from the years spent assisting at my parish as well as from having a couple of good friends who were priests. Fortunately for me, the program became my responsibility, and through my new duties I had the honor of getting to know a very special category of military servicemen – our chaplains. 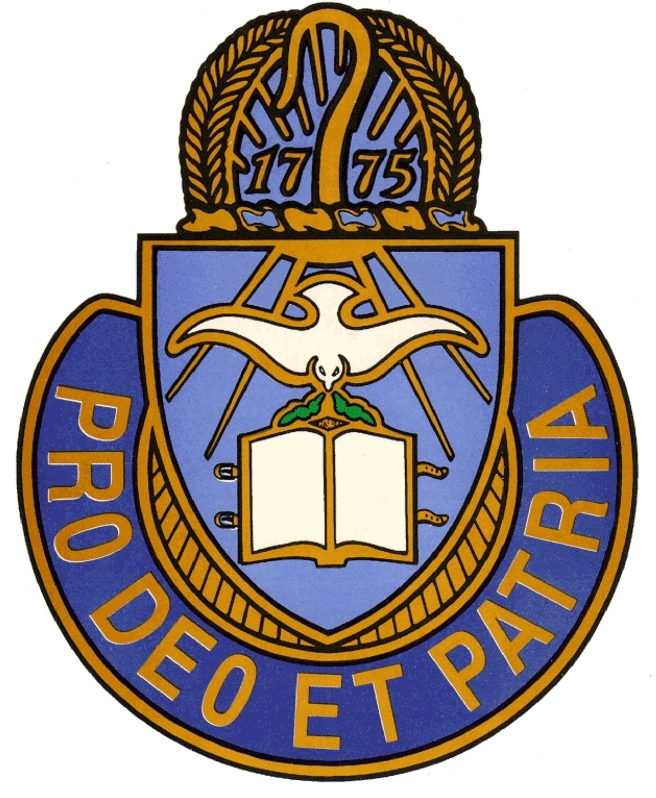 The seal of the U.S. Army Chaplain Corps: For God and Country. The Ecclesiastical Supplies Program provided Catholic/Christian, Jewish, and Muslim supplies to military chaplains. Some of the items, such as bibles, rosaries, or prayer books, were intended for the troops. Other items, like vestments, were for the chaplains’ use. The most significant items in our catalog were the “Chaplain’s Kits” which allowed the Chaplain to conduct religious services in the field – which literally could mean in the field, or in the desert, or wherever the troops and their chaplains found themselves without a chapel or any building for services. The kits were small but contained all of the necessary items for a priest to say Mass, and the altar linens were in a camouflage green color instead of white in case the service was being held under fire. I met many chaplains of all faiths during my time as manager of this program, and I was continually impressed by their ability to offer comfort even if the person in need did not share the chaplain’s own faith. I met a rabbi and a priest or two, but the majority of the chaplains I met were Protestant ministers – the military has an even bigger priest shortage than some other dioceses of the country. Because there were so few Catholic chaplains, they were in great demand and usually were responsible for ministering to thousands of soldiers even if they had to travel great distances to reach them all. Some may be surprised to hear that the military goes to great lengths to ensure that their servicemen and women are free to practice the religion of their choice and have ministers available for their religious needs. But chaplains have always been a part of the U.S. military – chaplains were present when General George Washington assumed command of the Continental Army as well as in every conflict since. In every war our country has fought there have been Catholic (and non-Catholic) chaplains serving alongside the soldiers, sailors, airmen, and marines. Chaplains are unarmed non-combatants whose mission is to provide for the religious needs of the unit whether that may be worship services or counseling sessions or rites such as marriages, baptisms, and funerals. Each war or conflict has examples of chaplains who have lost their lives while assisting other servicemen and many chaplains are recipients of the nation’s highest military honor, the Medal of Honor. One blog post is not long enough to give due credit to every chaplain in every conflict. But I’d like to name two of the Catholic priests who served so that more people can become familiar with their courageous stories. These two men in particular have received the title “Servant of God” which is the first step in the canonization process to sainthood. Fr. Emil Kapaun was born in 1916 in Kansas to Czech immigrants. He became a priest in 1940 and entered the U.S. Army Chaplain Corps in 1944. He served for two years, including in the Burma Theater. In 1948, he re-enlisted in the Army. In July, 1950, Fr. Kapaun was sent to Korea – one month before North Korea invaded South Korea. The unit he was with, the 35th Brigade from Ft. Bliss, engaged in combat as they moved north. During these battles, Fr. Kapaun would often run into mortar fire and risk his own life to rescue wounded soldiers and bring them to safety. 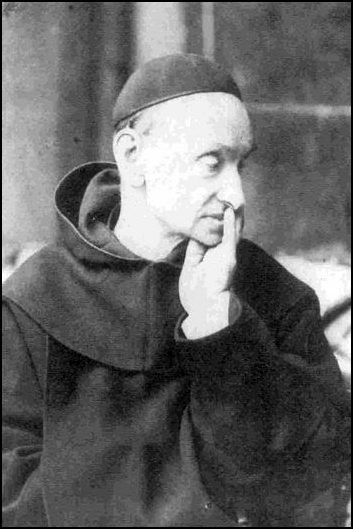 In November, 1950, Fr. Kapaun was with the 8th Cavalry Regiment when they were overrun by the Chinese Army. The Army retreated, but he stayed behind with the wounded soldiers and they were captured. Fr. Kapaun remained in a prisoner-of-war camp until his death on May 23, 1951. Survivors of that POW camp have testified that Fr. 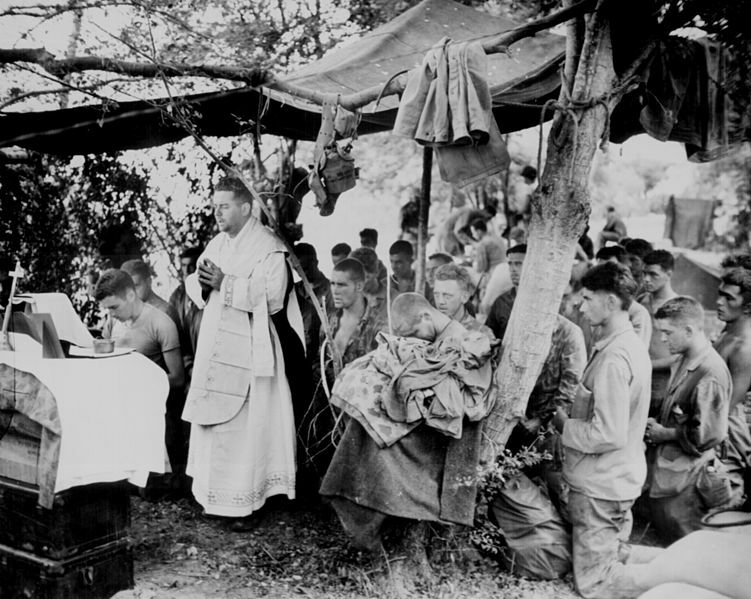 Kapaun ministered to fellow prisoners in both spiritual and physical ways. He would offer up his own portion of what little nourishment they received to others who were sick and challenged the prison guards when they mistreated the prisoners. Father also spent hours in prayer and helped many fellow prisoners with the Sacraments. Because of his heroic actions and devout life, the cause for his canonization to sainthood was opened in 1993. Several miracles have been attributed to Fr. Kapaun’s intercession and are under investigation by the Vatican. Fr. Vincent Capodanno, also known as “the Grunt Padre”, was born in 1929 in New York. He was ordained a priest in 1957 and became a missionary to Taiwan for seven years. In December, 1965, Fr. 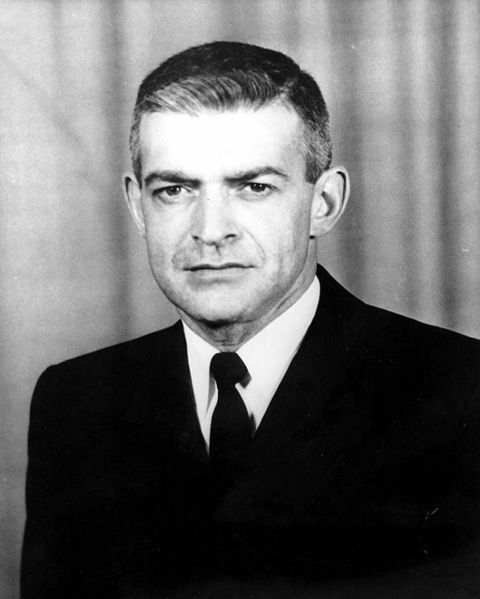 Capodanno became a chaplain with the U.S. Navy and was assigned to the First Marine Division in April, 1966. He was with the Marines on September 4, 1967 during Operation Swift when they engaged in battle with the North Vietnamese. Vastly outnumbered, the Marines took heavy casualties as they awaited reinforcements. Fr. Capodanno ministered to the wounded and offered last rites to the dying. Fr. Capodanno came under fire himself and was wounded in the face as well as his hand, which was nearly severed. Despite his injuries, he ran into fire to help a wounded Marine and was killed. For his heroic actions, he posthumously received the Medal of Honor. He was declared a “Servant of God” in 2006 as the first step in the canonization process. Many veterans testify to the good works of Fr. Capodanno and the difference he made in their lives. These are only two stories of Catholic priests who served as military chaplains serving those who serve by fighting for our country. 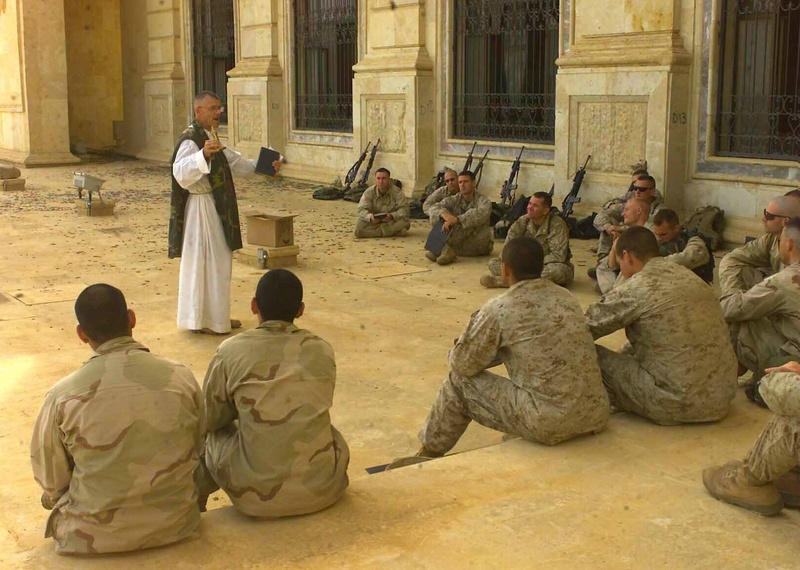 There are many other stories of brave and heroic deeds of chaplains, and this very day there are Catholic priests in Iraq and Afghanistan with our soldiers and Marines to provide for their spiritual needs. My work with the military chaplaincy became a career stepping stone for me, but I miss my chaplain friends to this day. Even though I am no longer responsible for the program, the chaplains still hold a special place in my heart. Today, on Veterans Day, we honor and salute all men and women who have served our country. But in a special way let’s also remember our chaplain veterans – the occasionally forgotten heroes of our country. Please offer a pray for all of those serving today, and may God strengthen our chaplains so that they can continue to offer support to our troops. Catholic Military Chaplains: America’s Forgotten Heroes – This article highlights several chaplains throughout history and lists several biographies so you can read about their inspiring lives. No Greater Sacrifice: Dorchester’s Four Chaplains – the story of the “Four Chaplains” (a priest, a rabbi, and two ministers) who offered their life vests to sailors as the USAT Dorchester sunk during World War II. Archdiocese for the Military Services, USA – Military members belong to this Archdiocese. Their publication, Salute, has some great stories about military members and their Catholic faith as well as the chaplains who minister to them. Who was the first African-American Catholic Priest? The answer is . . . it depends on who you ask and how you ask the question! And sometimes the same person will give two different answers! First a small personal admission: I don’t think I ever saw a black Catholic priest until I was well into my adulthood. I guess I assumed that there were some somewhere; I just never thought that much about it. The leading contenders are Father James Healy (1830-1900), ordained 1854; and Father Augustine Tolton (1854-1897), ordained 1886. The simple genealogical data would seem conclusive: James Healy was the first African-American priest. But it’s not quite that simple. The 1830 census of Jones County, Georgia, helps tell part of the story. That census shows a household that consists of a single white man and a number of slaves. Despite the characterization on the census, the slaves are in fact Michael Healy’s wife and children. According to Africana: The Encyclopedia of the African and African-American Experience, co-authored by Henry Louis Gates, Jr., Michael Healy had been an Irish soldier in the British Army who deserted in the War of 1812. He eventually made his way to Georgia where he acquired land and slaves. He began a relationship with a slave named Mary Eliza Smith and had children with her. Some reports claim that Healy and Mary Eliza were married by an itinerant preacher. Such a marriage would have been illegal under Georgia law at the time. Michael Healy acknowledged his children and was concerned for their welfare and education. He arranged for Mary Eliza and three of their sons, Hugh, Patrick, and James, to be sent north so that the boys could be educated. The Healy sons were enrolled in a Quaker school in New York State. Sometime later, they transferred to Holy Cross College in Massachusetts. James was the valedictorian of the 1849 graduating class. While at Holy Cross, James felt the call to the priesthood. Blacks were not admitted to American seminaries at the time, so James went first to a Canadian seminary in Montreal and then to the Sulpician seminary in Paris. In 1854 in Paris, he was ordained a priest of the Boston diocese. Healy spent some time as secretary to the bishop and then as an assistant pastor. In 1866, he became pastor of St James Church, the largest parish in Boston. Father Healy was a strong spokesman for Catholics in what was then a hostile environment. His work at St James led to his being selected as bishop of Portland, Maine, in 1875. Some African-Americans and others accuse Father Healy of forfeiting his relationship with the black community by not explicitly acknowledging his background. Father Augustine Tolton was born in 1854, the same year Bishop Healy was ordained. He was born in Ralls County, Missouri, the son of slaves. Some reports say that his father left the family to join the Union Army, but my cursory search found no evidence of that. In any event, during the Civil War, the family escaped slavery and moved to Illinois, a free state. One report claims that the slave owner, a man named Elliott, actually freed the Tolton family. An extension of that story and likely apocryphal, says that upon being freed, young Augustine was baptized in the waters of Brush Creek, with Mrs. Elliott as his godmother. The family ended up in Quincy, Illinois. Augustine attended Catholic schools in Quincy and heard the call to Holy Orders. But black men still were not permitted to attend American seminaries. In 1880, he went to Rome to attend seminary. He was ordained in 1886 and returned to the diocese of Alton, Illinois. Father Tolton became well-known in Illinois and was either loved or hated. At some point, he was transferred to Chicago. Some say this move can as the result of the antipathy of a white priest in the diocese. In Chicago, Father Tolton initially was assigned to a basement church that later became known as St Monica’s. His reputation grew and he did not hesitate to travel and speak to various groups of Catholics. 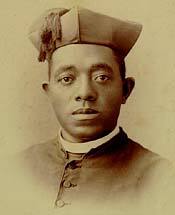 Unlike Bishop Healy, Father Tolton attended and spoke at the 1890 Congress of Colored Catholics. Father Tolton died of heat stroke in 1897, at the age of 43. So who is considered the first black priest in America? Some say it can’t be Bishop Healy, because he never “proclaimed” himself black. Less charitable folks say that Healy was “passing.” But by the racial rules in place then and now (although different “rules” now) Bishop Healy is properly considered the first man of African-American ancestry to be ordained a priest. Father Tolton is properly considered to be the first man with two slave parents to be ordained a priest. But, wait! There’s a third candidate! When I was in my 20s, my dad began the practice of sending me a calendar every year from an order of priests called the Josephites. This is an order of priests, officially known as the St. Joseph Society of the Sacred Heart, formed in 1893 to minister to African-Americans. The man given credit for leading the founding of the Josephites was Father Charles Randolph Uncles, a native of Baltimore. November 8 will mark the 152nd anniversary of Father Uncles’ birth in 1859. The congregation gathered to witness and participate in ceremonies was more than usually large and included many of the best colored people of the city. A special reason for the presence of the latter was that the first man of their race to be ordained a priest in the United States and that he was to have that high honor bestowed upon him by the Cardinal Archbishop himself–the primate of episcopacy of the country. As a young man, Charles was an altar boy at St. Frances Xavier. He graduated number one in his high school class. After that, he taught in the Baltimore County public schools until he was 25 years old. During this same period of time, he was being tutored by a priest from St. Joseph’s seminary (for black men only) in Baltimore. Finally in 1883, Charles Uncles went to St. Hyacinthe College in Quebec, graduating in 1888. Back in Baltimore he then entered St. Joseph’s seminary. But he applied to attend classes at St. Mary’s Seminary which was then for white men. The faculty of St. Mary’s put the matter to a vote of the seminarians. They were unanimously in favor of admitting Charles Uncles. And so it was that three years later, he was ordained a priest. He began teaching at the Epiphany Apostolic College, which was then located in Baltimore. In 1925, the college moved to New Windsor, New York, and Father Uncles moved also. He died on July 20, 1933 at the college, and is buried there. 1. 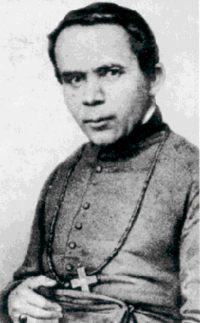 James Augustine Healy (1875-1900), ordained in Paris in 1854 for the Diocese of Boston, was the first priest and the first bishop of African ancestry in the United States. 2. Augustine Tolton (1854-1897), ordained in Paris in 1886 for the Diocese of Alton, Illinois, was the first priest of acknowledged African slave ancestry in the United States. 3. 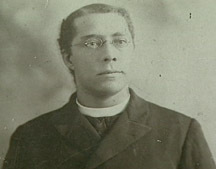 Charles Randolph Uncles (1859-1933), ordained in Baltimore in 1891 for the Archdiocese of Baltimore, was the first priest of African ancestry to be ordained in the United States.